“The ISTSS PTSD Prevention and treatment guidelines. Methodology and Recommendations and Position papers on Complex PTSD” have been published with the evidence summaries that generated the recommendations. The guidelines were finalized in October 2018. The recommendations are based on a systematic review of RCTs, conducting also metanalysis, using the approach of the Australian center for post-traumatic mental health, the Cochrane review, the NICE and the World Health Organization. High quality systematic reviews developed through the Cochrane collaboration, NICE and the WHO and RCTs from these reviews were used as the basis of the evidence. These were the criteria considered, revaluated and agreed for the ISTSS treatment guidelines. 5.500 potential studies were identified, plus those included in existing systematic reviews. The purpose was to see which interventions were effective in reducing symptoms of PTSD, RCTSs, effect size, early interventions, individual, group and couple interventions, etc. EMDR had a strong recommendation for the treatment of children and adolescents and for adults with PTSD. A strong recommendation means that interventions with a reasonable quality of evidence and the highest certainty of effect are available. Strong recommendation for EMDR for the treatment of children and adolescents with clinically relevant post traumatic stress symptoms. It has effects on clinically reduction of symptoms, improved functioning/quality of life.Strong recommendation for EMDR as a Psychological treatment for adults with PTSD.Intervention with emerging evidence for adults as early intervention. Single session of EMDR within the first 3 months of a traumatic event have emerging evidence of efficacy for the prevention and treatment of PTSD in adults. Standard recommendation of EMDR within the first 3 months in multiple sessions = CBT-T, Cognitive therapy (no interventions are considered strong). 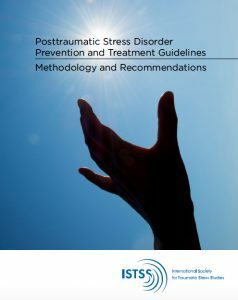 The new International Society for Traumatic Stress Studies™ guidelines on the prevention and treatment of post-traumatic stress disorder (PTSD), and position papers on complex PTSD, have recently been published. An international committee of experts was established in 2015 to update guidelines published in 2009 by reviewing the latest evidence from clinical research trials. The guidelines and position papers are intended to assist clinicians providing prevention and treatment interventions for children, adolescents and adults with, or at risk of, developing PTSD and Complex PTSD. Professor Julian Ford, ISTSS President, said, the excellent work of the ISTSS Treatment Guidelines Committee will make a real difference to people affected by traumatic events” .